Baby made amazing progress. Position of arms and legs is so different to other rings or swim seats. Much more horizontal and natural. Love the natural swimming position which is achieved with this ring. My baby really loves being independent from me and being able to use arms and legs freely. Making great progress and a confident swimmer in the making! The SWIMTRAINER gives children the necessary sense of achievement and security in the water during every stage of their development. This forms the basis for being successful at learning how to swim. With fun, children will develop a positive life long relationship with the water. 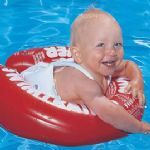 These specially designed baby swimming aids are introduced according to the child's age and learning ability (red, orange, yellow). 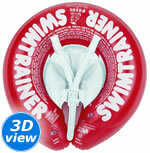 The SWIMTRAINER "Classic" is used with babies to support their early development. 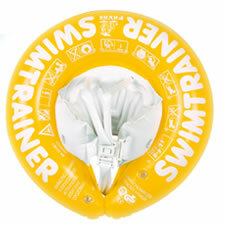 All SWIMTRAINER's are made off robust PVC and have five inflatable chambers. The practical clip fastener and inflatable shoulder straps allow fast and secure fitting. SWIMTRAINER's are tested by TÜV & GS, meet the Australian Standard "AS 1900 - 2002 Flotation aids for water familiarization and swimming tuition" and are phthalate free. The Swim Trainer provides your child with an deal swimming position in the water. Features inflatable pads to prevent slipping through and adjustable safety belt to prevent tipping forwards. Specially designed baby swimming aid. Made off robust PVC and with five inflatable chambers. 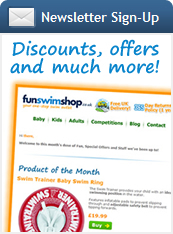 Provides your child with an deal swimming position in the water. Inflatable shoulder straps allow fast and secure fitting.